Since we announced our plans to save the Brewer-Young Mansion by converting it to professional offices we’ve been gratified to hear from so many who support our plans. It’s wonderful to see how many recognize this structure as an important part of Longmeadow’s history. We look forward to welcoming everyone to see the interior of the building at our first open house on Saturday, November 18, from noon to 3pm. Our plan for this property is based on the following factors. The mansion is too large and too costly to maintain for it to ever be a private residence again. The deterioration of this structure has reached a point that we must act soon if it is to be saved. The only long-term solution for this building will be for it to become self-sustaining. The mansion was put on the market seven years ago and has had no interest from any residential buyers. Restoring it will cost more than $2 million and the annual cost of living there, according to a prior owner, was approximately $100k (including taxes, insurance, heat, electric, grounds maintenance and routine repairs). If this historic building is going to be saved, it has to be now. We don’t have the luxury of waiting more years, hoping for a buyer to appear who can afford to spend $2-3 million on a home. We have all seen the mansion degrade to the point that it has become an eyesore and embarrassment to our town. The new columns put up by the bank look nice, but this is quite literally a façade because the rest of the structure has endured the same degree of degradation that caused those columns to collapse years ago. The shell of this building is rotting away before our eyes. It is natural for any change to engender questions and concerns. Here are some important things to know. Re-zoning this property would be for professional office use only, not commercial. So it can never be a retail store, restaurant, industrial park, or anything else. It can only be offices. Re-zoning this property in exactly this manner was set forth in Longmeadow’s 2004 long-range plan which foresaw the need for large, costly homes on Longmeadow Street to one day be converted to professional offices in order to survive. The Longmeadow Historical Commission has unanimously endorsed our plan. This group of historically minded public servants has spent the last seven years studying this problem and searching for alternative solutions. They evaluated our plan, feel it is consistent with preserving the history of Longmeadow, and believe saving this landmark is beneficial to the historic district and the town of Longmeadow as a whole. The parking area will be set back from the street and almost completely shielded from view. The necessary parking will begin more than 100 feet from the street and the entry drive will be curved to limit the line of sight into this area. There is already an opaque hedge that runs across the front of the property and another layer of opaque landscaping around the parking area will further obscure it. The impact on traffic should be minimal. A traffic study is being completed, but we already know that the traffic generated currently by our primary tenant, Dr. Glen Brooks, at his current location four doors away from the mansion will now simply move to our location, on the same street, approximately equidistant from the same intersection. Fully restored, the mansion would generate about $50,000 in property taxes for the town. If the mansion were to be lost, the property would generate practically no taxes. The Longmeadow Historic District Commission (HDC) will forever protect the historic appearance of this structure. No future owner can change its appearance without approval from the HDC. If the mansion were to be struck by lightning and burn down, the design of any new building would also have to be approved by the HDC. Therefore, anything built at this location in the future would look historically appropriate. Professional offices are the only use that can generate enough stable income to restore and maintain this property long-term for our town. We have analyzed numerous other commercial uses. If we fail to be re-zoned we will not be coming back with another business idea (such as B&B, condos) because no other idea is fiscally viable given the mansion’s high restoration costs. 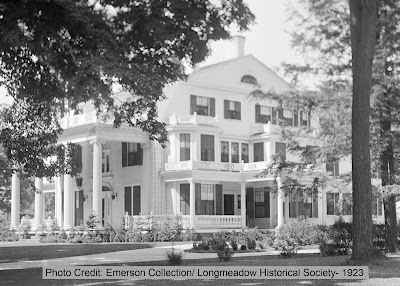 In addition, with professional offices, much of the historic interior can be preserved and we hope to install a permanent exhibit that the public can come and enjoy that will highlight the history of the mansion and its importance to Longmeadow. There is no historical foundation or benefactor that will rescue this mansion. Members of the Historical Commission labored for years searching for such an entity, to no avail. Re-zoning this property does not mean it will suddenly be easier for other houses in town to be re-zoned. Any such properties would still have to go through the very arduous and robust process we are currently pursuing and could be blocked by multiple boards along the way and at town meeting. To suggest that re-zoning the Young Mansion would lead to the re-zoning of many other homes is to ignore the obvious uniqueness of this structure and this circumstance. There is simply no other home like it in town. Its size and prominence sets it apart from all the other buildings in the historic district. We can trust that future planning boards and town meetings will recognize this and realize that this action was necessary to save this irreplaceable structure on our green. It’s true that our town will always have a penchant against re-zoning. The only reason why we are hopeful that our request will pass is because it is clear that this building is too large to be a single family home but too important to lose, both historically and architecturally. To be re-zoned, we need a 2/3 vote at a special town meeting (probably in early January), which is a tall order. We are definitely the underdogs. We will need everyone who cares about saving Longmeadow’s history to come out and vote. We know that there are some opponents to our plan who would rather see the mansion demolished than be re-zoned for anything but residential. They sincerely believe it is better for Longmeadow if there are no changes at all with respect to the green. We respect their views, and we truly wish the mansion could simply be a family’s home in perpetuity, but we think it is obvious that this will not happen. Quite frankly, if the mansion is lost and an empty lot took its place, that in itself would be a significant change in the appearance of the green. We feel it would benefit Longmeadow and the historic district to preserve this building so that it again looks grand and beautiful, while also serving the community in a useful way. The character of the green is comprised of the buildings that surround it. If we lose those buildings, we will lose that character, and it cannot be replaced. It is important to remember that the green is not a museum like Sturbridge Village. Nor is it entirely residential. There’s already a business, school, library, church, and community house in the historic district. These institutions, even more than the houses, are what give the green its vitality because they bring people to it. The green is not static; it continues to change with time. In the past, there were several businesses in the historic district. Some even reverted back to residential homes, such as the “Old House on the Green,” which was a restaurant and B&B next to Center School at 797 Longmeadow St until the 1960s, or the house at 857 Longmeadow St, on the other side of Center School, which used to be a doctor’s office. Please follow us on Facebook where our prior posts have addressed topics like why offices are the best use, why condos won’t work, and the parking area in more detail. And we hope everyone will come to our open house on November 18 and see firsthand why this building is worth fighting to preserve.